With Nvidia’s new Volta GPU architecture looming on the horizon, Nvidia is clearly looking to squeeze as much mileage out of its ageing Pascal architecture as possible. The prices of the GTX 1070 and 1080 have been cut, and the GTX 1070 Ti has been pushed out, acting as a halfway house. In terms of GPU structure, the GTX 1070 Ti is closer to the GTX 1080 than the 1070. It’s based on the same GP104 GPU, but with a single streaming multiprocessor (SM) disabled, giving the GTX 1070 Ti a total of 2,432 stream processors – not much below the count of 2,560 stream processors in the GTX 1080. As a point of comparison, the standard GTX 1070 cuts five SMs from the GP104 architecture, giving you just 1,920 stream processors. The 1070 Ti even has the same 256-bit memory interface, 64 ROPs and 1,607MHz base clock as the GTX 1080. The latter has a higher quoted boost clock, but in reality, these GPUs regularly boost higher than their conservatively quoted boost clocks anyway. During tests, the GTX 1070 Ti was regularly boosting to 1,911MHz, for example. The only other main difference between the GPUs is that the 1070 Ti doesn’t have the 10GHz (effective) GDDR5X memory of the 1080, instead having standard GDDR5 memory running at 8,008MHz (effective). Clock speed is also an interesting factor when it comes to the third-party cards, as all of them currently run at the stock speeds, with no factory-overclocked models available. That’s not to say that there’s no overclocking headroom available, though. 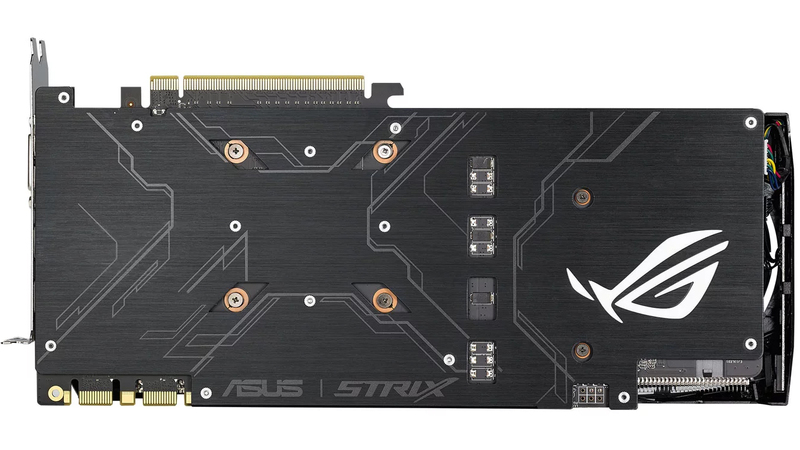 The Strix card that Asus sent proudly sports an “Advanced Binned” sticker, signifying that Asus has sifted through several GTX 1070 Ti samples to find the most overclockable ones, and used them to make these ROG Strix cards. The Asus card itself is a familiar sight now, with a hefty heatsink, a metal backplate and three fans that only spin up when the GPU temperature demands it. The ROG Strix card also supports Asus’ Aura RGB lighting system, which can be controlled via software and linked with other Aura components. There’s an LED-lit ROG logo on the back, and light shines through the holes around the fans, too. It looks and feels like a seriously well-made piece of tech gear. 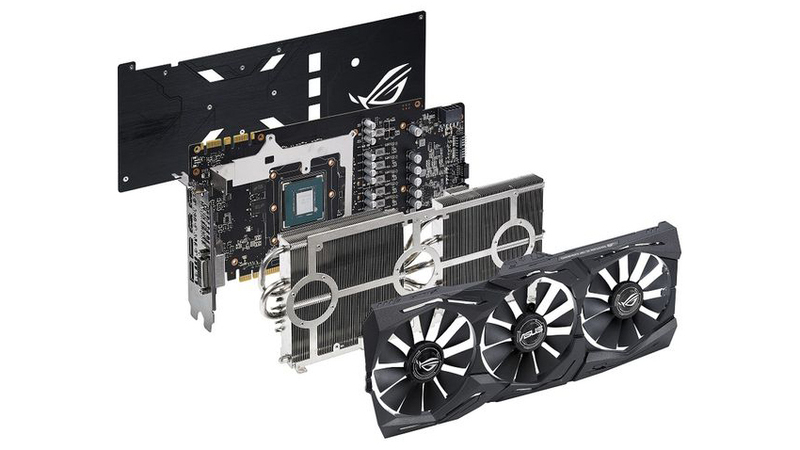 These bonuses demand a premium, though – the Strix card was £495 inc VAT at the time of writing, but you could buy a basic Asus GTX 1070 TI card with a blower fan for just £428 inc VAT, and the Strix card isn’t even pre-overclocked. At stock speed, the GTX 1070 Ti was a little underwhelming, being noticeably behind a stock-speed GTX 1080 but only slightly in front of a Zotac AMP! GTX 1070. Of course, the Zotac card has the benefit of being overclocked, while the Asus 1070 Ti card runs at stock speeds, but with no factory-overclocked samples available, the GTX 1070 Ti will need to fight hard to justify its premium over overclocked 1070 cards. It’s a decent GPU at stock speed, though. It ran all our test games fine at 2,560 x 1,440, with an amazing minimum of 106fps in Doom. Even Deus Ex: Mankind Divided didn’t drop below 48fps at this resolution. It can just about cope with 4K gaming, managing a 54fps minimum in Doom, and a 36fps minimum in Fallout 4 at High settings. Deus Ex pushes it hard, with a 25fps minimum, which is only borderline playable. It’s a fast GPU at stock speed, but it needs a boost to make it worth the premium over the GTX 1070. That may not be a worry if you buy this Asus card, though. Overclocking headroom will vary between cards, of course, but our sample was extremely overclockable. We don’t have a non-Strix sample to gauge overclocking on a standard 1070 Ti card, but it’s clear that many GTX 1070 Ti chips have plenty of headroom. For peace of mind, you can simply run Asus’ GPU Tweak II software on the Strix card to apply a decent overclock. It automatically detects the Advanced Binned chip, and enables you to set a 1,759MHz boost clock in OC mode. But there’s room to push it much further. In fact, we managed to clock the memory frequency all the way up to 2,177MHz (8,708MHz effective), while adding 163MHz to the core, resulting in a 2,062MHz boost during our game tests. The result of this overclock was a massive performance boost, taking the 4K Fallout 4 minimum up to 40fps at High settings, and The Witcher 3 minimum up to 41fps at 4K with High settings. When overclocked, the GTX 1070 Ti significantly pulls away from an overclock GTX 1070, offering near-GTX 1080 levels of performance. This overclock didn’t have a dramatic effect on thermals and power draw either. The card was still supremely quiet during testing, and the whole test system drew 309W from the mains when overclocked, compared to 287W at stock speed. Comparatively, our system drew 408W with a stockspeed Radeon RX Vega 64 card installed, demonstrating the great efficiency of Nvidia’s Pascal architecture. With no factory overclocks, the GTX 1070 Ti isn’t quite the clear-cut winner of the mid-range GPU market that you’d expect. At stock speed, it ends up being only slightly quicker than overclocked GTX 1070 cards, and a fair way off GTX 1080 cards, while demanding a premium over the former. If you’re prepared to get your hands dirty, though, the Asus ROG Strix GTX 1070 Ti has loads of overclocking headroom, enabling you to get near-GTX 1080 levels of performance for under £500, while also getting a well-built, quiet and attractive card in the process. The same money will just about buy you a GTX 1080, but only with a noisy blower cooler. It’s a shame the situation isn’t quite so clear-cut though. With little competition from AMD, the GTX 1070 Ti could easily be an outstanding winner in its price league. As it is, it only just about manages to hit the sweet spot, just do us a favour and don’t buy it at current prices.